Why Don’t You Become A WP-Tonic Affiliate Partner! All you have to do is recommend WP-Tonic using your affiliate link on your website, blog, Facebook, Twitter or other social networks. We pay upfront $250.00 payment connected to our “Essential packages”*. We pay upfront $500.00 payment connected to our “Growth packages”*. We pay 25% finder payment connected to our “Done for you” packages**. 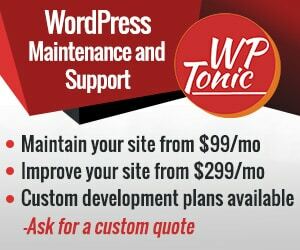 *WP-Tonic pays 25% recurring commissions for the life of the client connected to our essential and concierge plans. **You can also receive 25% referral free connected to our “Done For You” packages” these packages start at $2,500 to around $5,000 Plus. We pay our affiliates on all our packages after a 31 day period after your referral has signed up & payed for one of our support or support/hosting plans. • Put affiliate links and WP-Tonic branded graphics on your site. • Use an affiliate link in your email newsletter. • Write a review of the service after trying it out for your own website. • Invite the WP-Tonic founder, Jonathan Denwood, on your site for an interview or guest post. • Partner up with Jonathan to present a webinar for your audience. We are focused on providing value to your audience and to you. Get creative and send us your ideas!